Recently, I received a lovely children’s book, Cricket in the Grass, illustrated and written by a gardening friend. The cricket in the title makes an appearance only at the beginning of the wordless story as a passing toad eats it! The toad soon meets a similar fate. And so the chain continues, a lesson in the importance of all creatures—field, forest, or garden—in the food web. While we often equate garden allies with “good bugs” that eat “bad bugs,” ecologically speaking, it is more accurate to think of them as prey and predators. Orthoptera, which include grasshoppers, katydids, and crickets, almost always fall into the category of prey. While a few species may cause damage—sometimes extensive—most are fairly innocuous and serve as an important food source for many species of birds, mammals, amphibians, and reptiles. Orthoptera are also nutritious food for people in numerous cultures around the world. High in protein and low in cholesterol, entomophagy (the eating of insects) is becoming increasingly accepted as we seek ways to feed a hungry planet. Orthoptera have saltatorial hind legs adapted for jumping, a characteristic for the order. They may be winged or wingless; wings are often leathery. All have chewing mouthparts. While most feed on plants, some are omnivorous, and others feed on decomposing matter. Orthoptera are found in most habitats but are most common in arid grasslands and deserts. This is an order of singers! To attract females, males chirp, trill, and click by rubbing together their forewings, or hind legs and forewings, depending on the subfamily to which they belong. The loudest males are often the largest and most successful in attracting mates. In many cultures crickets are thought to be harbingers of good luck. Japan, with a culture fascinated by many things entomological, has a long history of appreciating Orthopteran music. Very elaborate, sometimes valuable, small cages are crafted to house crickets. At the end of the summer at the Insect Hearing Festival, the insects are released into nature in a joyous cacophony. Orthoptera are divided into several families. Grasshopppers, the family Acrididae, are most abundant in arid, grassy habitats where they feed on grasses and forbs. They possess short antennae and most adults have wings and fly well. Grasshoppers are divided into several subfamilies. 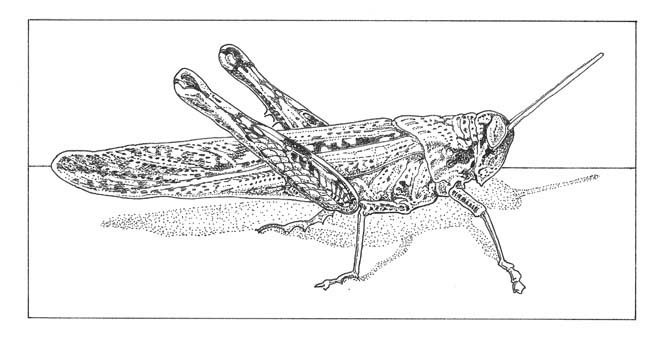 The spine-breasted locusts include the aptly named devastating grasshopper (Melanoplus devastator), which periodically wreaks havoc on agricultural crops. Like other true locusts, it exhibits gregarious and migratory behaviors. Of the more than 550 grasshopper species found in North America, few—most are Melanoplus species—cause significant crop damage or have an economic impact. Species in the subfamily band-winged grasshoppers are effectively camouflaged to blend into the deserts, canyons, and arid grasslands they favor, but in flight display beautifully colored hind wings as a secondary defense intended to startle predators. The subfamily of slant-faced grasshoppers is easily recognized by the characteristic pointed heads and slanted faces and includes several desert species. The bright colors of lubber grasshoppers, heavy-bodied insects with stumpy wings, advertise their bad taste and are an exception to the rule that Orthopterans taste good; an example of aposematic, or warning coloration shared by lady bugs and other insects. The family Tettigoniidae, the katydids, have very long antennae and can be hard to spot as many species mimic leaves—even having “veins”—and are nocturnal. By rubbing the base of their forewings together, males are able to produce a variety of notes to attract females; in contrast to most orthopterans, the females are able to produce sounds in response. 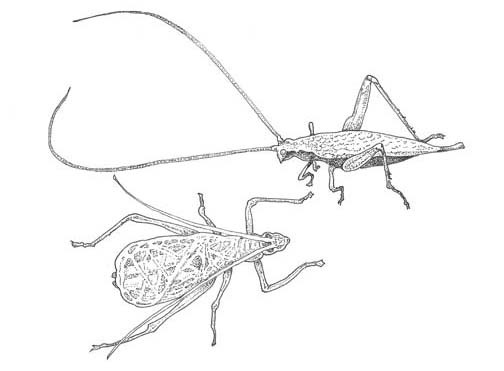 The shield-back katydid superficially resembles other orthopterans but is distinguished by its long antennae. 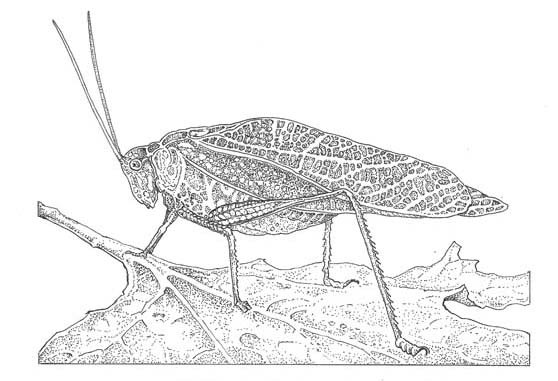 While katydids eat leaves, they also include omnivorous species. These beautiful insects are always welcome in my garden. Ground and camel crickets, the family Gryllacrididae, which at one time included the Jerusalem cricket (see Garden Allies, October 2013), are generally ground dwellers although some species are found in trees. Their colors are subdued, they have long antennae, and lack wings; the camel crickets have curious “humped” backs. The Gryllacrididae are silent. The family Gryllidae includes common field crickets and tree crickets. Ground dwelling field crickets are found in fields and grasslands and cause significant crop losses in years when their numbers are abundant. Among orthopterans, the Gryllidae are the most musically accomplished. One of the pleasures of a summer evening is to go out with a young guest and a flashlight to track down snowy tree crickets, whose soft trill serenades us from the trees and shrubs.